I award this award with being the best looking blogging award badge. Sorry, old Liebster badge; you is ugly. 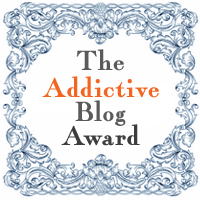 I was recently awarded The Addictive Blog Award by A Flock of Crows. No, not a literal flock of crows. The only thing I’ve ever been awarded by a bird is The Crap on My Head Award by a pigeon in Chicago, and I’m not going to dignify that award with a hyperlink, much less a blog post. Seriously, though, I am really flattered to receive this award from A Flock of Crows because hers is one of the most inspirational and thought-provoking blogs I’ve come across lately. I was first exposed to her when she was Freshly Pressed, but I’ve loved everything else she’s written so that one post wasn’t a flash in the pan. Please check her out! 2, Nominate ten others for the award. Why do I blog? I’ll keep this short and sweet because we all know that you’re only reading this out of politeness and just want to see if I gave you an award. I know the haps. I blog because it’s the best hobby I’ve ever had. One, it’s free if you want it to be. I pay like $7 for my special fonts, but that is the only money I’ve ever invested in this whole outfit. Two, you are doing something creative. I love sitting down and writing, for me and for you. I love exploring the possibilities of what I can put in a post. Three, it is so freaking interactive. And not only is blogging a great way to meet new people, it is a way to meet wonderful new people. Most importantly, though, I blog because it helps me nail down who I am. When I started blogging, I was a pregnant woman who was on the cusp of the greatest adventures I’ve ever known. I was not working for the first time in my adult life, and I was wondering – whether I knew it or not – who I was becoming. Now, I’m a mom. Every day is a new challenge in the quest to know myself. Blogging helps me sort that out. Plus, a blog is one awesome baby book. I hope Miss C will someday enjoy the posts I wrote about her, both when she was in my belly and when she came out. The Passing-On I would like to pass this award on to ten blogs that I have truly become addicted to since I last did an awards post. I’m not just picking the first ten blogs I see in my queue right now. These are blogs I can’t get enough of. A Gripping Life Not gonna lie; I’m kind of in love with Lisa AKA Grippy. Her thoughts on life are entertaining, thought-provoking, engaging, and often hilarious. Lily in Canada Lily is Lisa’s daughter. She is HI-larious. If she charged to read her blog, I would probably pay. A Clown on Fire I know, I know. Join the club. There’s a reason why people are obsessed with this guy, though. It’s impossible to visit his blog and not be sucked in. Psychobabble I love this blog because I never really know what I’m going to get, but I do know that I will love it. She blogs about her upcoming wedding, the ghost in the apartment next to her, and her life as a newly-licensed family therapist. Lame Adventures Witty, wonderful, and thoughtful writing from a New Yorker. I feel smarter when I read this blog. Sincerely, Slapdash Christine, AKA Fish, is one of the most authentic people I have come across in the blogging world. She keeps it real, and real is funny, so I love her blog. Speaker7 Oh.Em.Gee. You aren’t reading Speaker7? WHY? Just why? You have no excuse. None whatsoever. I banish thee. Never Contrary I’m pretty sure I’ve given her a blogging award (or seven) before. But she deserves them. I love her observations about everything. Mooselicker The more I read Tim’s funny essays on the mundane, the more I’m convinced that I would have had a crush on him if we had gone to high school together. Guapola Pure, unadulterated fun. Guap is likely one of the nicest people in the world and his blog is just an extension of the thoughtfulness and fun he brings to all of our blogs in the form of comments. And there you have it. Blogs I’m addicted to. Now, who wants to run the Betty Ford Center for blogs? You deserve every single praise that comes your way, I’m thrilled that you are recognized for your blogging. And I want to sincerely thank you for the nomination. Le Clown doesn’t do awards, even though he appreciates the sentiments. I’m grateful that you’ve thought of me and my blog. And congratulations to all the other nominations and bloggers! Kudos to everyone in this great beautiful blogosphere. Thanks! You deserve all your acclaim as well. No worries about not passing it on. If you did awards, you would probably have to make the posts a twice weekly feature. Oh Emily! You are too kind! Awwww, thanks! The feeling is obviously mutual. Don’t hold your breathe on that book though. It’s going at a snail’s pace. Hopefully I’ll be able to finish it before C goes to college! Congrats!! An award well earned!! Thanks! I freaking love awards. They give me the warm fuzzies. Right back atcha! Thank goodness for Freshly Pressed! I think you are the only real real active follower I gained from that experience. You keep plugging away and you will so get there! Then we will all say we knew you way back! Psychobabble is like a box of chocolates…you never know what you’re gonna get. Thank you!!!! And congrats to you! And this gets me excited to launch into one of my favorite rants about how “addiction” is not actually a diagnosable disorder…weeee! Ooooh! I can’t wait to read it! I love it when you you talk all psychologically. Really!? Well happy birthday, girl! Your gold lame lipstick is in the mail. Haha you know me too well! I love all things gold lame. Grippy has a bunch of photos of Lily on her blog today, so we can all chose an era from her life and dress up as her. I call baby Lily. Mazel tov on your award! I already follow almost all of the blogs you listed, but I’ll have to check out the ones I don’t so I can catch up! We kind of have an inbred circle at this point, eh? It always cracks me up when everyone reblogs the same posts because then I have the same post like four times in a row in my feed. What can I say though? We run with a great blogging crowd. Thanks, Weebs! All of your awards are well-deserved! I’ll have to check out the blogs you listed. Congrats! Thanks, Snarky! Hope you enjoy them! Holy cats, you’ve put me in some incredible company up there! Off to check out the few I don’t already know, and to head to your early posts to see how this all started. Congratulations to you! Calling your blog addictive is an understatement. “And not only is blogging a great way to meet new people, it is a way to meet wonderful new people.” I couldn’t agree more! Congrats on the award. You passed it along to some fine specimen! Thanks, Jen! I love blogging because I get to meet people like you. Full disclosure: I kind of have a fantasy in my head that since you live in Portland, you are besties with Carrie Brownstein and Fred Armisen. Emily, that’s so generous of you to include me amongst such accomplished members of the blogorati. The admiration is mutual. You’re a very talented writer and I always enjoy reading your posts. You’re one of my blogger buddies that helps keep my brain out of moth balls. Hey, that IS a pretty sweet looking award. And it has given me some new blogs to check out! I know, right?! A lot of the award badges are getting makeovers, I noticed. The old Versatile Blogger Award badge seriously looks like I created it in ClarisWorks paint when I was 11. Thanks, Aiden! I hope you enjoy them as much as I do! They are all awesome people on top of being compelling writers. Thanks for the award and congrats to yourself! But let’s be honest, your crush on me in high school would have been confused hormones wanting any attention from a boy. You are far too kind as always. Congrats on your fake award! I think your nominations are fabulous, too! ← I’m kind of a big deal.